Burberry Brit, for me, is the fragrance a high school graduate who’s just decided she’s too good for a body mist and wants needs a perfume. Something a little more complex, something with a hint of maturity, and something that costs a little bit of green. Brit is a smooth woodsy gourmand with an impressive wear length that’s a couple dimensions beyond a body spray. In Bottle: Sharp citrus and vanilla almond. I get the lime right out of the bottle as it’s sitting up top but there’s also the woodsiness sitting there too. The woods are actually trying to trick my nose into labeling this scent as spicy. Despite all this, it is unmistakably a gourmand scent to me as the almond and vanilla will refuse to make me think any other way on that front. Applied: Striking flair of citrus right on impact, it takes a few minutes but the citrus dissolves into this fruity, juicy pear and almond mix that carries the fragrance until the vanilla comes up. Brit’s vanilla doesn’t pull any punches, it’s sweet, domineering, and unapologetic. It amps up and mixes with the almond and eventually drowns the pear until all I get is vanilla, a touch of almond, and that tricky spicy but-not-really wood note. I’d have to say the wood note is what’s really saving this fragrance from being a vanilla single note. It adds a much needed and much appreciated depth that stands its own for hours with the vanilla. Overall, Brit is a warm, smooth vanilla fragrance with a wood base. A well-done and very young gourmand. Extra: Over the years since the first iteration of Brit came out, there’s been three flankers; Brit Sheer, Brit Red, Brit Gold. I have only smelled Brit Sheer, which to me is a much sharper, citrus treatment that somehow managed to be even more inoffensive than the original Brit and I have always considered Brit to be quite agreeable already. Design: I absolutely hate the bottle design for the Brit bottles. Big, heavy rectangles of clear glass covered in Burberry’s signature tartan. It was a tremendous let-down and the design, to me, seemed like an afterthought. It looks tacky to be honest. Holding the bottle feels a bit like holding a tartan striped brick. The cap is a plastic cube, forgivable in many instances, but it hurts the bottle design here even more. I can see they maybe have been going for the simple angle but missed it and landed in plain and utilitarian. This is one fragrance I think would really benefit from a bottle redesign. Notes: Lime, pear, almond, mahogany, vanilla, tonka. The original Brit is one of the more iconic and recent gourmand fragrances. With an inoffensive and pleasing vanilla note this should satisfy anyone looking for a more up-scale and complex vanilla scent than a body mist. 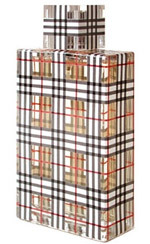 Reviewed in This Post: Burberry Brit, 2008, Eau de Parfum. This entry was posted in burberry, gourmand, Reviews By House, sweet and tagged almond, burberry, burberry brit, fragrance, gourmand, juicy pear, lime, mahogany, pear, tonka, vanilla, vanilla almond. Bookmark the permalink. Many years ago I liked Brit (in EdP concentration, I didn’t like EdT) and for a while concidered buying a bottle… but never did. My 16 years old syster likes and wears it now. It’s nice on her. I used to like Brit too. Actually I really liked it when I posted this review. But using up a 100ml bottle, I find, tires me out on a fragrance. Especially when you used it as often as I did. I think I’m over Brit for the moment, but at the time, it was a nice spicy kick in the mornings just before work.